Roleplay and crossovers. That was me and Jaz. That's pretty much been me my whole life, though now I had someone equally interested in both at my side. Upon trying to edit something on Wikipedia - Wiki Hunters: a site where Boba Fett will come after you if you mess up a wiki page. Better disguise ourselves as robots using the Teselecta. Want to spice up college life? School Invasion - where enemies of various franchises invade education buildings, with the various people within claiming powers from said various franchises to fight the invaders off. Homer Simpson appears in the same battle as Lord Voldemort? Not ending well. However we ended up working these roleplays, Star Wars and Doctor Who would always be at the forefront. Of course, Jaz was already involved with the Doctor Who fan fiction timeline, already working on audio dramas for his version of The Doctor. He had a few ideas down for a Doctor Who/Star Wars Crossover, though asked for my input. Thus the great partnership began for the series that became Doctor Who: The Star Wars Chronicles. The start of the ideas began at the end of October in 2011. Various sound effects were sourced from that point on, and a theme was made by Jaz - as well as the promotional picture - while I worked on the script and we both continued exchanging ideas. My original start lacked much in the way dialogue and a clear indication of sounds. My first audio, it took a bit to get used to. Communication was key in getting sounds right, and audio and written files were traded and discussed quite a lot. Thus the opening battle being devoid of Dalek voices, which added to the suspense of who was killing the Stormtroopers. And I guess, one thing I should get out of the way - we wanted to set the story in a period that wouldn't clash with either franchise, both canon and fanon timeline wise. No Obi-Wan, Luke, Leia, Yoda. No Maul, Dooku, Vader. And since it was set in the fanon timeline, Jaz already had access to his Doctor's time period, so that was easily sorted. And so within two weeks, the first episode was finished, development of the second began, and on the 11th November Universal Jump was uploaded to The Jaz Network - Jaz's Youtube channel. Since he already had a following and already had audio dramas of his Doctor on the channel, it was decided the series would be better there. Rather than my channel which at that time I think was still running under its old name of ninplaydo and had a grand total of one or two videos [which were removed]. Episode Two was slower to get started, even though the ideas were around. Details were finalised, and it introduced DarkRula into the story. Originally, I was set to record lines as DarkRula, who is essentially my character within the Star Wars universe. This idea continued and the script was finalised at the beginning of December. Ideas for Episode Three started as soon as Episode Two's script was finished. Recording started, and it became clear me doing the voice of DarkRula just wouldn't cut it. The recording equipment I had at the time [literally earphones used as a microphone] just wouldn't do anything good. So the decision was made to bring someone in. Les Ortega was contacted by Jaz and he accepted to do the voice. After some direction from me, he did a pretty good voice for DarkRula. Fun fact - the audio was originally set to be six episodes, and from the production of the second episode, we knew we wanted to set the end on Endor. The last episode. 2012 begins, as this is the year I get into the networking business. First with the two fan fiction stories - Pokémon: Shadow Boom and Star Wars: Darth Maul. Then followed the blog at the start of E3 in June. 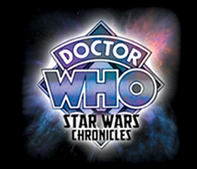 Though of course, the audio series of Doctor Who: The Star Wars Chronicles was still in production. Episode Three was to separate the two arcs, and set up the finale. Episode Two was being worked on by Jaz, and Dalek Fire was finished and uploaded on the 23rd January. Heavily edited voices like Kronis and droids sounded different from Universal Jump as the configuration files for editing were lost. A female voice actor had contacted Jaz about wanting to join the crew, so a female character was included in the ideas we had circulating around. It was also Jaz's turn at writing an episode, as he had a great idea. It was here that my idea might have been lost, had it not been for what came later. But with Jaz came a trip to Tatooine, the TARDIS suffering a lot from travelling, and a fellow Doctor voice actor joined the crew as a one time bad guy. The female voice actor would take the role of someone who helps DarkRula and The Doctor to the base of the bad guy after he steals the TARDIS. The end of January brings the suggestion of using the ideas of backstory that have been built up through the creation of the audio episodes and for me to work on a written version of the world, starting from when the Daleks first arrive in the Star Wars universe. The beginning of February and the initial planning for Episode Four starts. As well as the beginning of the written side of the series on my website. The first story followed The Doctor as he comes across a power struggle between Daleks and Cybermen, intending to stop it. Which he does, though unknowingly causing the destruction of a planet and causing the rift which sends everything from the world scattered across the Star Wars universe. In other words, the first story of a series called Doctor Who: The Star Wars Chronicles is set in the universe of Doctor Who. Back to the audio series, and discussion is set on getting me as a voice in the series. So planning starts once again for both Episode Four and Episode Five, this time with ideas for a new character that would be played by me. Script work for Episode Four gets finished bar a few changes before Episode Three gets recorded. At the beginning of May, production picks up again. Jaz also has the idea of recreating the first episode of the fiction as an audio. So Hop and Drop is made as an audio, and appears on both Youtube channels - making that audio the first official video on my rebranded channel. With everything now coming together on Episode Three, Hide and Seek gets uploaded on the 19th May. And so Kerian Twine joins as Thalos, with Elizabeth Stewart as Thalia. By this point, Episode Four's script was fully completed, and Episode Five's script was halfway completed. Again I had to pass on voicing one of my own characters. The Mandalorian Krayt Skirata was a character by me, but I still didn't have anything great to record with, even though I did have a microphone this time around [a cheap one though]. Script work was progressing, with extra stuff being added and some parts being changed. We were targeting a July release for Episode Four. However, college work got in the way, and was forgot about over the summer holiday. Production picked up at the end of August, and the beginning of September gave an idea. Why not merge Episodes Four and Five together? They are both part of the same story, being the ending arc. So that is what happened. Production of both as one episode slowly gets moving across September and October. The full Episode Four gets uploaded on 3rd November. Final Descent uses a word from each of the two episode titles that it was planned to be. Episode Four was planned to be called Dark Descents, with Episode Five being called Final Throwdown, the midway point being when the TARDIS gets blown out into space. The only thing bad about this episode was that it was the final one. For me, the audio work was done. However, the fiction would continue. And I had been busy with the fiction, as when the audio came to an end, I had reached the beginning of it in the fiction. And The Doctor's story would continue within the audios, back in his own universe. It was great to be working within the fanon works, and in a way I still am. The adventures of DarkRula and The Doctor continue within the fiction, and when one of the audio episodes come up in the fiction, it gets expanded on. While I will be going into further detail on this in the second part to this blog post, the general idea is that the episodes are greatly expanded with multiple viewpoints that never come up within the audios themselves. Even when audio episodes aren't being directly covered, there are some elements or plots that come up that relate to them. The takeover on Tatooine in Rizon Fire [F4.12], for example, is a prequel of sorts to Hide and Seek [A3]. Of course, all of this will be covered in Part 2 of Doctor Who: The Star Wars Chronicles - Look Back, Look Ahead.